The Sony LSPX-S1 Glass Sound Speaker is somewhat unique, not your usual portable speakers. When Porta-Fi was offered a review unit by Sony, images of Sony NSA-PF1 aka Sountina came to my mind. Sountina which was introduced in May 2008, an elegant speaker system offering a room-filling soundstage through omnidirectional sound from an organic glass tube tweeter, as well as three LEDs which one could adjust to represent the mood of the day. Clearly designed to be the centrepiece of living space, the Sountina shipped on June 2008 for 1,050,000 JPY in Japan. In a recent interview, Yasushi Matsumoto, TS Business Division, Senior Consumer Experience Producer confirmed that “the Glass Sound Speaker has its roots in the “Sountina” NSA-PF1, which originated in 2008”. While the Sony LSPX-S1 Glass Sound Speaker has its roots in the “Sountina” NSA-PF1, the Glass Sound Speaker from the company’s Life Space UX division is a lot smaller, measuring just 82mm (dia.) × 303 (H) mm compared to 325 (W) x 1,845 (H) x 325 (D) mm of the Sountina. 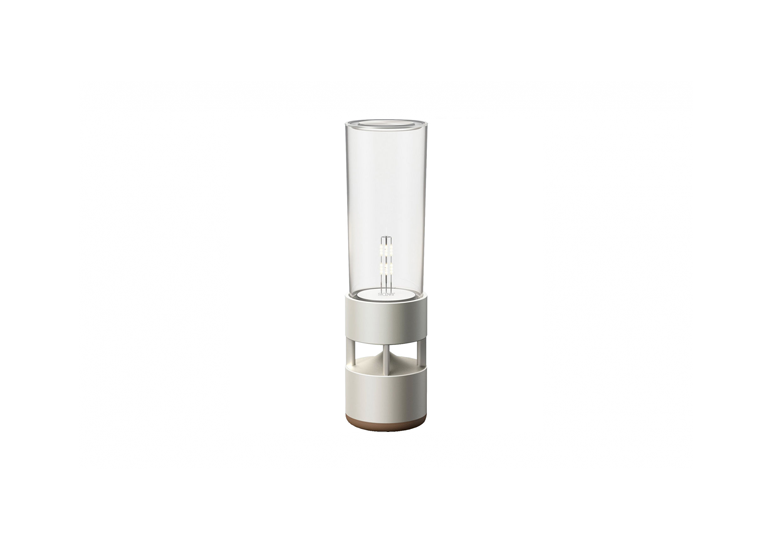 Designed to be portable, the LSPX-S1 Glass Sound Speaker weighs in at 920g and can be moved around freely as it features Bluetooth connectivity as well as an integrated rechargeable battery which gives one about 4 hours of usage, dependent on the volume and illumination settings. 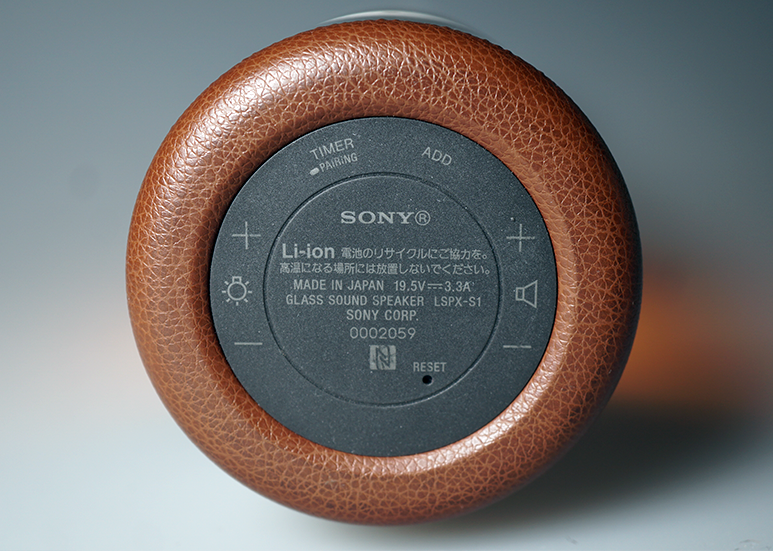 One could opt to adjust the volume and illumination on the smartphone via Sony’s Songpal app. If you are one who prefers physical controls, the adjustment buttons for both are found at the bottom the speaker. Hidden out of sight, while the design disguises the device’s true identity as a speaker, it is also inconvenient should one chose to access the physical controls. Extracting the DNAs from the Sountina, the LSPX-S1 Glass Sound Speaker sports the organic glass cylinder, featuring only 3 actuators instead of 4 found on the Sountina. These actuators contain oscillators to vibrate the organic glass tube allowing it to mimic a tweeter providing the high-end. A 50mm woofer is built into the aluminium base station to provide the low-end and mid-range. 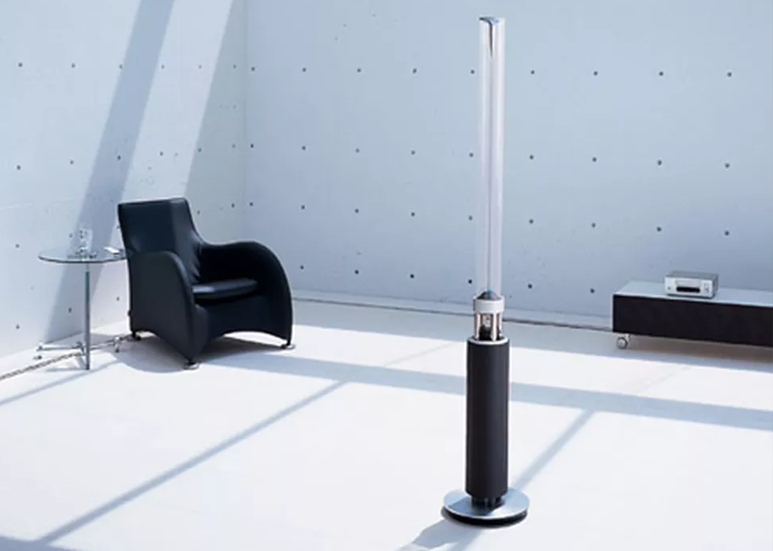 The sound is channelled out of the organic glass tube delivering a 360-degree or omnidirectional sound with an impressive frequency range of 60Hz to 40kHz out of a 2-way speaker design compared to 50Hz to 20kHz on the Sountina. On the matter of light, the three LEDs on the Sountina is replaced by a warm-coloured filament-style LED bulb. 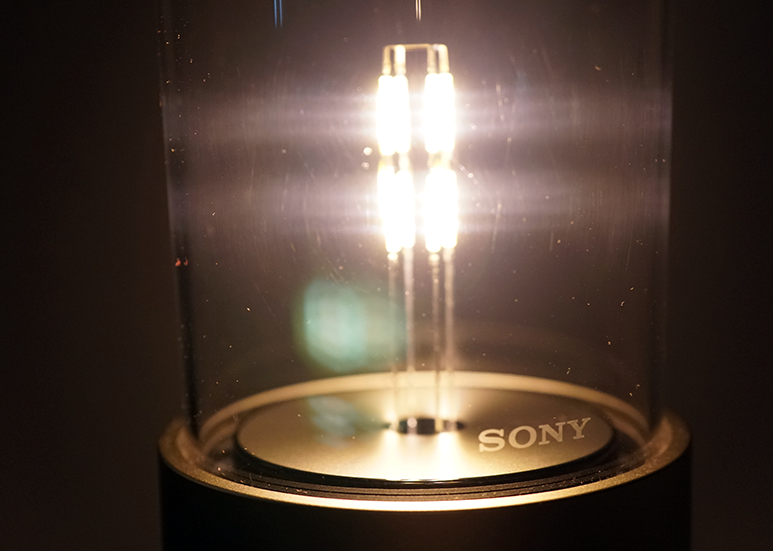 The combination of the organic glass tube and the filament-style LED bulb has made the LSPX-S1 look more like a modern candle lamp than a portable speaker. I have invited individuals who have not seen the LSPX-S1 over to the Porta-Fi experience lab where background music was playing when they entered. The visitors stood looking for the speaker, never once realizing the lamp on the shelf was responsible. The build quality of the speaker is excellent, using machined aluminium finished in pale gold colour for the body provides an elegant outlook that will not look out of place in most interior designs.